Generating pixeroids was never so much fun. 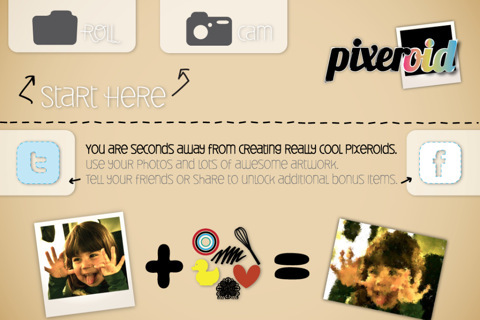 Easily create pixeroids by selecting your pictures and share it with your friends to get bonus artwork. Use the generated pixeroids as wallpapers, posters or set it as your social network website’s profile picture. The use of the app is really easy. Select a picture. Select the artwork you want to see on your picture and wait till your pixeroid gets built. During this process, you can pause the process if you want to make any change in the artwork. After changing the artwork and other settings, resume to the process and watch your pixeroid getting build. There’s a half price special offer for a limited time. So, don’t be late to get this app. The app costs $1.99 only. Draw the beautiful work of art and whatever you want with this app. It was never so easy to create complex designs. Choose what you want to draw and this app will provide you the tools you need. 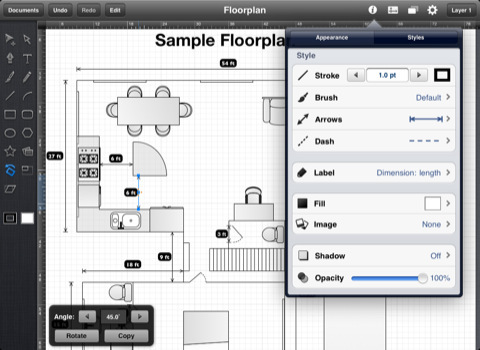 Use the Brush tool or pencil tool to sketch a design. Tools like color picker, powerful pen, font panel, multi-color gradient editor and more are available. Canvas scale, rulers are available for your ease. You can use multiple layers to draw unique and complex designs. And once you are done, you can export your work as PDF, SVG, PNG or JPEG files. If you want to show your artwork to your friends, you can even mail it to them. Integration with DropBox is there that will help you to upload your artwork to your DropBox account so that you can get it later. iDraw is a great and wonderful application. With its easy-to-use user interface, you can easily design whatever you want. The app costs $8.99. Check it out! You can open your office files with much ease and comfort. Office² HD supports doc, docx, XLS, PPT files. You can open, view and edit any office document. Not only this, Office² HD also gives you access to all your stored documents by easily accessing them in Google Docs, DropBox etc. 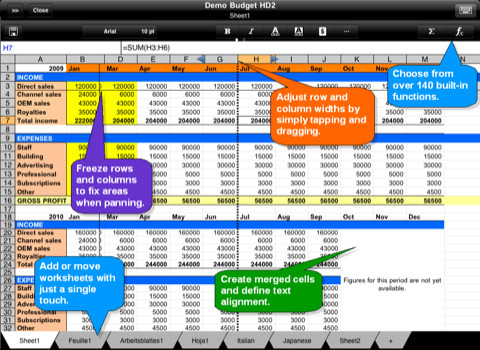 Make your presentations, word documents or spreadsheets in a cool way. You can also get your documents from your email attachments and you can send your saved ones through email, too. Word supports Text and fill color, changing font size and style, formatting of a paragraph, inserting images, spell check, auto-correction and undo-redo. PowerPoint supports inserting images, paragraph formatting, slide ordering, slideshow, rotation of shapes and texts etc. Spreadsheet supports handling multiple worksheets, cell formatting, merging cells, date formats and separations, pane freezing sorting cells, changing heights and widths of rows and columns and a lot more. You can save your work in PDF format too. So, whenever you are in hurry and you have your presentation coming in a short time, use your iPad. 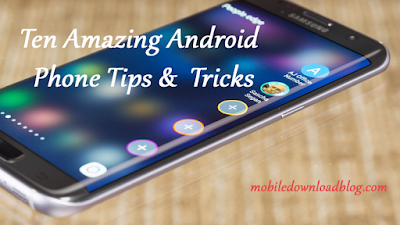 Tap the screen or attach an external keyboard to work much easily. The app costs $7.99 only.